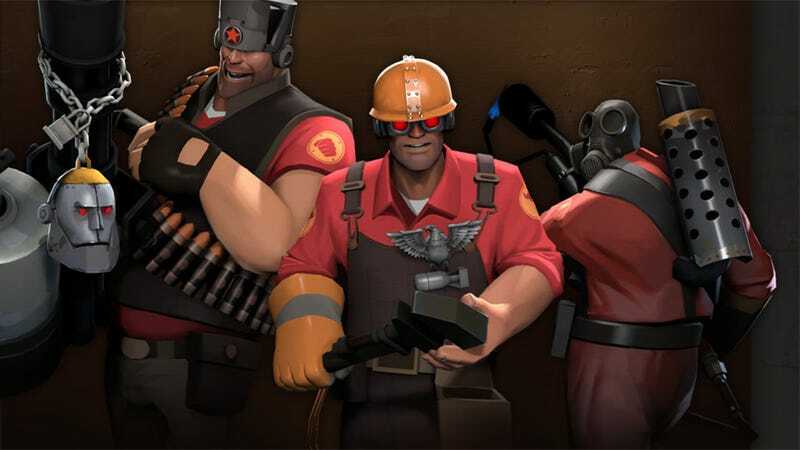 It's the third and final day of reveals for Team Fortress 2's big Mann vs Machine update, and Valve has saved the most important for last. Well, most important if you're the kind of person who's still playing TF2. Because if you are, you probably enjoy hats. The robot wars will include a game mode called Mann Up. Completing these maps (which can be linked together to form "tours of duty") gets you rare loot in the forms of attire and accessories for your characters. But to get onto those maps you have to pay. Think of it as an amusement park ride. You pay $0.99 for a ticket (this isn't part of the metaphor, it's actually what you pay and what you get), and that ticket is used to get on an official Valve Mann Up server. Once there, you're in line to get the rare loot. Still...this is a game whose entire economy is built around hats. Now that there are better and newer hats, making money shouldn't be a problem for Valve. Mann vs Machine is now out and ready for download.